At one time, cloth diapers were the only option parents had to work with. So, when disposable diapers hit the shelves, moms flocked to them due to the sheer convenience of being able to just change and throw them away. Now however, cloth diapers have started to make a comeback and they’re better than they ever were before. If you’re trying to decide whether or not cloth diapers are right for your family, here you’ll discover the pros and cons of using them. When you look at the first two benefits listed, it’s easy to see why cloth diapers are gaining in popularity. Money and the environment are two of the most important things people care about these days. So, having a diaper that fits both needs is a fantastic incentive. Now, you may argue that cloth diapers aren’t cheaper than disposable diapers and initially that is true. The initial cost of buying cloth compared to disposable diapers is much higher. However, it is the long-term costs where you’re making savings. Did you know that the average cost of using disposable diapers until your little one is potty trained, is $1500 to $2000? When you compare this to the cost of cloth diapers, which according to the Real Diaper Association, can cost as little as $375, you soon realize cloth is the much cheaper option! In terms of the environment, as cloth diapers don’t have to be thrown away, they rarely find themselves in landfill. It’s said that over 90% of disposable diapers end up in landfill sites. However, that isn’t to say that cloth diaper don’t have any impact on the environment – they do. They need to be washed frequently, which means you’re using additional water and energy which can lead to air pollution. When you compare the environmental impact of the two however, cloth diapers logically appear to be the better option. Finally, cloth diapers have been known to be gentler on baby’s skin. Some babies can develop an allergic reaction to the chemicals found in disposable diapers. If you do a little research, you’ll discover many parents praise cloth diapers for clearing up their little one’s skin and fewer diaper rashes are reported. Changing any type of diaper is unpleasant, but when you’re out and about, the experience is made worse by the fact you can’t just throw the dirty cloth diaper away. Instead, you’re going to need to carry it around with you until you get home. If you’re lucky, there will be wash room facilities available to wash them there and then. However, if you’re travelling you may not have this luxury so will instead end up carrying it in your diaper bag, conscious of the potential smell that may be trailing behind you wherever you go. They’re also much less absorbent than disposable diapers, which means they’re going to need to be changed more frequently. If they aren’t, it could lead to an increased risk of diaper rash. Another problem with this is that they’re more prone to leak, so you could end up having to clean much more than you bargained for if they aren’t changed quickly enough. Finally, the cost to buy cloth diapers initially is more expensive than buying disposables. As mentioned earlier, you will be saving in the long term, but some parents may not have the initial money to spend on cloth diapers. It’s recommended you shop around and look online for great deals if you are on a tight budget. Should I Use A Cloth Diaper Service? Long gone are the days when you had to manually wash cloth diapers. The introduction of cloth diaper services has proved revolutionary for squeamish parents who can’t stomach the idea of washing the diaper themselves. However, it can total around $20 per week so it’s not going to suit all parent’s budgets. If you can afford it, you’ll find local diaper services now tend to use biodegradable detergents to protect the environment and protect baby’s skin. They take care of the mess for you and can even supply you with new cloth diapers if required. Again, if money saving is top of your priority list, a diaper service isn’t for you. The annual cost of using this type of service equals the amount you would spend on disposable diapers. Overall, it’s not hard to see why many parents are converting back to cloth diapers these days. There are so many different varieties available now and they’re even sold in multiple designs. 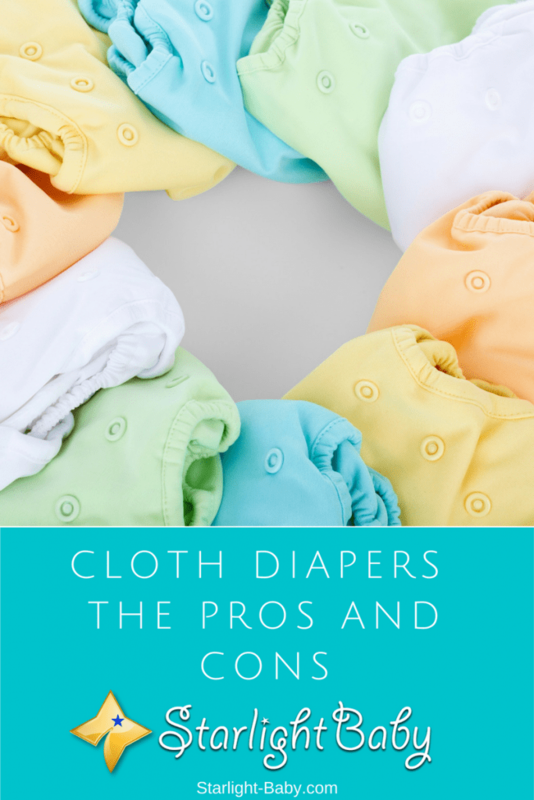 Before deciding whether or not to start using cloth diapers, it’s important to take both the pros and cons into consideration. Homemade Vs Store Bought Baby Food – Which Is Better? We really appreciate you sharing your story, and it just goes to show how many factors go into making a decision like this. There are certainly lots of upsides and downsides, and as you rightly point it out, it can really come down to that sort of thing. We use disposable diapers as well as cloth diapers, we use cloth diapers more than disposable diapers. We use disposable diapers only when we are taking the child outdoors (to the doctor or visit to other places), or the mother is too lazy to do the changing and washing. I agree with the advantages and disadvantages you have mentioned here. Leakage is one major problem of cloth diaper, rest is negligible. You’re right, vinaya, leakage is the biggest disadvantage of using a cloth diaper, plus you have to keep changing it everytime the baby pees or poops. It’s a hassle, however, it does mean fewer incidents of rashes for a baby. When going out, you’re right to use disposable diapers because it can stay on the baby longer as compared to a cloth diaper. You do not need to immediately change it so it’s convenient when you go out with the baby. Some parents also find it more convenient to use disposable diapers at night so as not to frequently disrupt the baby’s sleep. During the cold weather, babies also tend to pee/urinate more so some parents also choose to use disposable diapers but use them interchangeably with cloth diapers. Personally, I’m not a fan of clothe diapers. Maybe they were a trend back then but in my view recently with disposable diapers invoke, the cloth diapers aren’t worth the stress. As much as it’s good and more soft regarding the sensitive nature of the baby’s skin, it’s much prone to getting dirty and messy. This reason alone is a major turn off for me about using cloth diapers. Irrespective of the fact that cloth diapers can’t be easy to use like the other disposable pampers, I still think it’s something this current generation should take a look at and adopt. There is no harm in doing so just that there is lots of work when it comes to keeping the cloth diapers clean at the end of every day.